"The way SharpCloud enables you to roll up and aggregate the information, and look at it from a project portfolio, risk or milestone perspective, makes it a very powerful tool for senior management and leadership teams to make more informed proactive decisions." Jason talks about how SharpCloud provides improved efficiency by visualising and communicating business processes and data in a visual, easy to use and interactive way. SharpCloud has solved a number of business problems, from capturing data at workshops to carrying out interactive meetings with people in different locations, through to roadmapping and engaging client or organisational presentations. One of the most significant problems SharpCloud has helped to solve has been in Project and Portfolio Management. An organisation might be using a mix of risk, project planning and cost management software and a plethora of spreadsheets but they are all separate and not totally integrated with one another, nor can you interact with them or add context. Being visual, SharpCloud can visualise the different types of data attributes; risk, cost, milestones, health and safety etc, and at the same time allow you to add context around it, and further content to it, and dive down into more detail if you need to. SharpCloud acts like an overall project portal, which provides a window into your portfolio of projects, allowing you to drill down in granularity and look at the digital data coming from the system of records as well as the context and comments around any particular issue or opportunity, within the individual projects or portfolio. The way SharpCloud enables you to roll up and aggregate the information and look at it from a portfolio perspective or across all projects from a risk or milestone perspective, and filter those out on different regions, people or type of project, makes it a very powerful tool for senior management and leadership teams to make more informed proactive decisions rather than re-actively waiting for historical reports. Typically, functional meetings and weekly reporting are manual, very paper orientated and quickly out of date. In contrast, SharpCloud has real time feeds coming from the system of records and is aggregating that into one simple view or different prescribed views, that you can filter dynamically and add comments to, giving real time interaction and collaboration. You can also add and update your contextual data manually at anytime from your laptop or mobile device. Why have other tools not solved the problem? Other tools specifically focus on key areas such as risk, project planning or health and safety. For example, a project planning tool will look at resources but not at quality control or Health and Safety for example. These tools don't have the ability to aggregate all the information needed, in a very simple visual way and in one place, where people can interact with it. SharpCloud is uniquely positioned in that you can visualise different types of data in a meaningful way, yet allow people to interact with it. Being allowed to interact and collaborate with the information is key - this is where other systems and tools are quite restrictive. A common use case is project management within the Engineering and Construction sector. This industry has been around for thousands of years and relies on a large and complex supply chain of other organisations to help design, deliver and maintain assets. SharpCloud is helping to solve the problem by capturing, integrating and sharing data from various suppliers and contractors to provide a aggregated view of the project(s) for the main contractor, developer or client. By being mobile, easy to use and cost effective with free access for viewers, the barrier to entry and interaction with SharpCloud is minimal and provides up to date information to the supply chain, who are helping to deliver the project. No one misses emails, decisions or loses “project/corporate knowledge” as its all retained within the project or specific aspect of the project, within the SharpCloud story. SharpCloud is really helping us to efficiently communicate, collaborate and share what's really important across a portfolio of projects. SharpCloud is acting as an aggregator, bringing all of the data together. With SharpCloud for Enterprise, you can have multiple stories covering multiple parts of a project e.g. design, procurement, construction, which can be aggregated together into the project portfolio. This is especially beneficial for global projects as it minimises the need for travel to meetings, saving time and money, as well as offering an easy way to feedback and interact on a project. From a story creators (editor) perspective, being able to create a standard data model is important, to keep consistency across projects. With SharpCloud's standard templated stories, data governance and quality is built in, ensuring all data across a project is consistent and standard views can be configured as required. 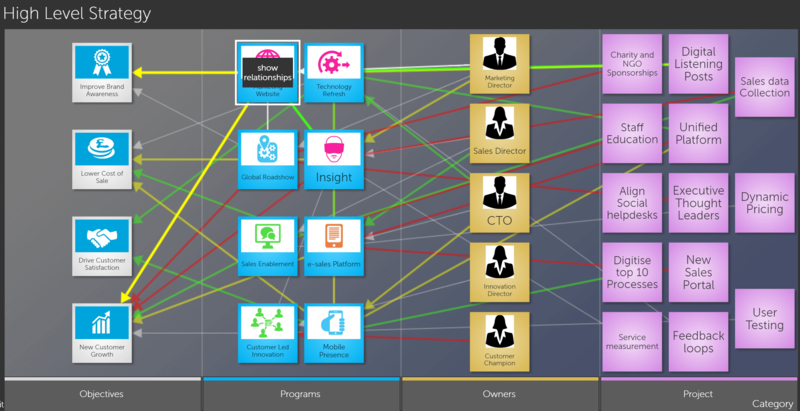 From a viewers perspective, a tool which is very visual, easy to use and intuitive, and combines risks, actions and milestones, and shows relationships and interdependencies in a colourful, filtering dynamic way, is something that's not readily available. SharpCloud provides a lot of analysis capability and enables you to get answers to questions you couldn’t answer quickly and easily before. You can explore 'what if' scenarios and filter out projects, data attributes, select tags, create new views “on the go” and start to gain more insight to your projects and be proactive, rather than reactive. 'Forms' are also a great feature within SharpCloud for submitting changes to a project for example. Using a pre-designed form, changes are submitted and automatically added to the project, updating the project and portfolio in real time. Previously changes to a project could have taken weeks to filter through the business. Forms are a very powerful but simple way of making changes to a project or submitting ideas in a workshop with immediate effect. For me personally, I like the visualisation and interaction, it suits the way I work. 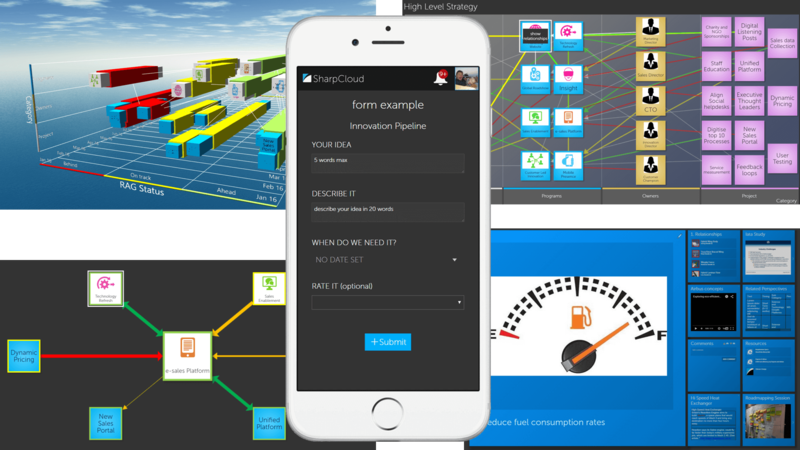 SharpCloud is a very visual way of bringing together big complex problems and people into a simple view or set of views to collaborate and move forward. With the ability to create new data driven views, changing the content of the view easily, depending on the audience, means you don’t have to wait several days for someone else to get the data, complete further analysis, update the PowerPoint presentation and wait for the next time you meet. You just do it there and then. From our organsiations perspective, SharpCloud compliments our consulting work and acts as a differentiator. 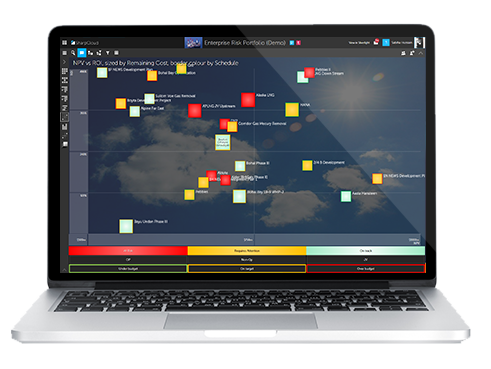 SharpCloud exposes weaknesses in a constructive way and enables us and you to look at projects in different dimensions - real time visually and collaboratively. 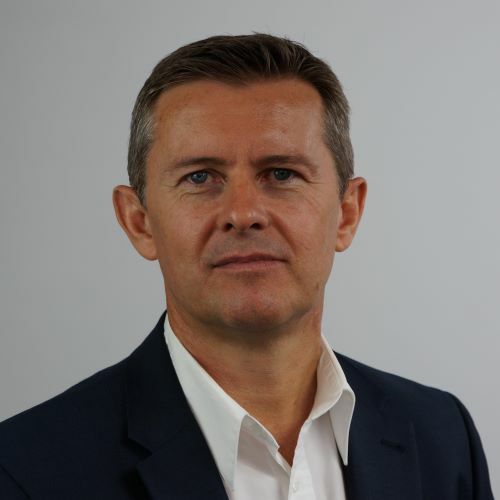 Another great benefit is the time and cost saving, using SharpCloud for workshops, where senior directors and leadership are looking at a project portfolio. With people located globally, what would normally take three days and cost thousands in travel, work is completed in less than half a day, with everyone interacting via SharpCloud. A stakeholder management workshop and assessment, for a large international charity, with many global participants, was achieved in less than 3 hours using SharpCloud. This saved an inordinate amount of time and money, which is especially important for a charity. Everyone could participate from their own location. Visually collaborating, recording the actions and outcomes in one place, simplifies your meetings and improves overall productivity. These are just a couple of examples and many more exist. Many clients are becoming more proactive and collaborative as a result of using SharpCloud by visualising and communicating their business processes and data in a visual, easy to use and interactive way. Roelto is committed to helping businesses everywhere achieve their full potential through successful visual collaboration. Through the proper implementation of both BS 11000 and SharpCloud, they will ensure that your visual collaborations are successful and long-lasting and that you are in a position to make the most of your business data.